1 Million Books for Gambia began in 2008 when A Hand in Health volunteers collaborated with CEO Kebba Badgie of the Sulayman Junkung General Hospital. Sulayman Junkung General Hospital was built in 2003 on the basis that it would become a state-of-the-art teaching hospital, incorporating students from the capital city, from all over Gambia, and, some day, from all over the world. With a lack of resources, however, this simply wasn’t possible. While Mr. Badgie had high hopes to fulfill this role, he had no means to make this dream a reality. And with this hope the project idea was born. A Hand in Health initiated phase one of the Million Books project in September of 2008. 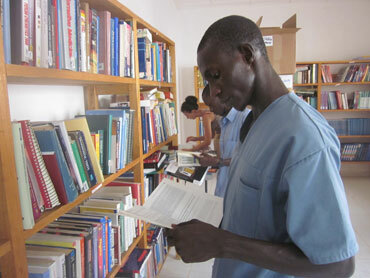 The project was to establish the Sulaymn Junkung Medical Library, the first public medical library in all of The Gambia. AHIH conducted fundraising events throughout the next two years, raising awareness and promoting the project. Through partnership with Books For Africa, AHIH was able to fund and secure 7,500 books for the project. A five-person volunteer team arrived in Gambia two weeks before book arrival to collaborate with local partners and start planning the new library. Then on August 3rd, 2010, the books arrived and the library officially began. To date this project has delivered an amazing 653,000 books to classrooms and libraries in The Gambia since 2008! These books have impacted the lives of so many, but there is still much to do before we reach our ultimate goal of one million books to The Gambia - Be a part of the change! Donate today!